We are all familiar with the advantages and benefits of the technological world. Needless to say, though our new era of scientific and technological advancement is constantly improving, there are associated draw-backs and failures. It doesn’t matter which type of equipment your field of expertise requires, something is always bound to go wrong. The important thing, however—is to know and address these mistakes properly and accordingly. Have you ever re-booted your laptop or computer, and been surprised to find a glaring blue screen screaming right at you? 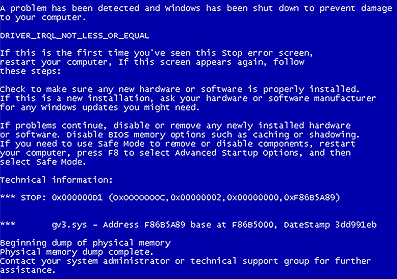 That right there is called the blue screen of death; technically called Stop Errors. This is what happens when something is seriously wrong with your computer, and there are many causes as to why this can happen. In this article, we’ll take a look at some of the common causes—and explore the best ways to solve this issue, right in the comfort of your own home or office. 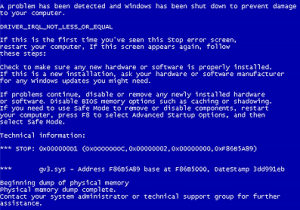 Generally, the Blue Screen of Death represents a malfunction of some sort. It can involve file corruptions, RAM complications and problems with the motherboard. This issue is common on Window’s operating systems, where there is a hardware or driver complication that otherwise does not permit the machine to operate effectively. This problem may be solved by a reboot of your computer or laptop, however—many times this will not work. There are ways that you can narrow-down the cause of the problem and therefore perform an efficient diagnosis of your PC status. This, in turn, will allow you to tackle the problem from a different perspective (Eg: if it were a hardware issue rather than driver issue). So, what can you do to manage this? You have several options. Read the messages that appear in the error code. This code may consist of numbers and letters. This will vary depending on the source and nature of the problem on your computer, so no two error codes are alike. Make sure you write down the error code for future reference. If you have just installed new software and have been prompted with an error message, try to uninstall the program. Again, you should be able to seek-out the nature of the message before trying to uninstall any software. Another option you may find easy is to use the system-restore option in the control panel. Usually, this will take your computer back to a safe-point in time where it was not affected by this issue. If you wish to find out what caused this issue, your best bet is to look it up on a search engine. There are millions of users out there that have also encountered this “lovely message” who may know of a way to solve the issue that may have not been thought of previously.